I am interested in a reciprocal link between our websites. Yes, I will have a link placed on my website to your website. 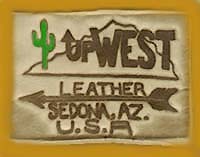 and http://www.upwestleather.com as the link address. Much better than a simple link is a paragraph containing a link. Please use the paragraph below on your site and send us the paragrah you would like us to put on your site. Please link the underlined words. Custom handmade western leather clothing. Buckskin dusters, jackets, shirts; vests, handmade leather; rattlesnake coats, luggage; Native American artifacts. Click on the page links below.